Karting’s star-on-the-rise Emerson Harvey has a strong personal connection with the little known, but devastating condition, Epidermolysis Bullosa (EB). Tilly Wilkes was born in 2011 with the genetic disorder when Emerson was playing football with her older brother. “I remember when Tilly was born, her family was in shock because Tilly had been diagnosed with this rare and chronically painful condition,” said Emerson. Emerson is honoured to be invited to be a Junior Ambassador for the Foundation which is working world-wide to find a cure for this heartbreaking disease. Epidermolysis Bullosa is a debilitating skin disorder and a life sentence for children and families who live with the pain day in, day out. The mission of the EB Research Foundation is to raise funds and awareness for vital research into a cure. Tilly and EB sufferers lack a critical protein that binds the layers of skin together. Without this protein, the skin tears apart, blisters and sheers off, leading to severe pain, disfigurement and constant open wounds. EB affects the body inside and out. Living with EB is likened to living with third degree burns and there is no cure. Emerson hopes to help raise much needed awareness. “Tilly is so positive and full of life, but she lives in extreme pain every day. Her skin is as fragile as the wings of a butterfly. Creating more awareness will hopefully help raise funds for science and eventually a cure”. 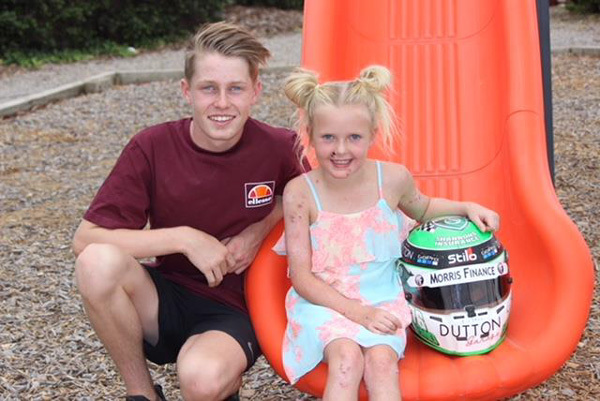 Emerson has had a strong start to the 2018 season and will be driving for Tilly and the EB Research Foundation when he heads to Albury for Round 2 of the Australia Karting Championship on April 14 and 15 before travelling to Newcastle and Northern Queensland.